› Integrating Mail Tracking of Packages Tracking of package via DHL, UPS, SingPost SpeedPost services are now more convenient. Regardless of carrier choice - DHL, UPS or even SingPost SpeedPost (Air Parcel / Worldwide Courier (EMS) - you may track all your package at 1 location at www.thepostalconnect.com. › SpeedPost (Air Parcel, Worldwide Courier, Islandwide Delivery) Services now available at The Postal Connect. Carry widest range of items, ranging from Bubble Wrap, Kraft Envelopes, Jiffylite Mailer / Envelopes, Padded Envelopes, Poly Mailers, Packaging Tapes, Postal (Postpac) Box e.t.c. Looking to manage your eCommerce Mail Logistics? Check out The Postal Connect mail solution today! Offer widest variety of mail option under 1-roof! SingPost Airmail, SingPost Registered Mail, SingPost AR, SpeedPost Air Parcel, SpeedPost Worldwide Courier (EMS), DHL, UPS, e..t.c. Discount for Airmail services for eCommerce Merchants. Discount for DHL, UPS e.t.c. Email Notification Alert. Sending tracking information to your customers directly from TPC Mail Management Portal. One Stop Tracking Portal to track packges posted out rom Singapore. 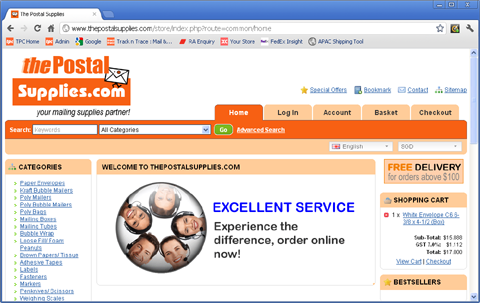 Tracking of Registered Mail, SpeedPost Air Parcel, EMS, DHL, FedEx & UPS are supported. Have overloaded your luggage with gifts and souvenirs? Still travelling to other destinations before returning to your country? Want to release your luggage space? Drop by our office to send your extra loads back to your country. Click here for our location map. 1-Stop Global Mailing Solution Provider. Competitive Registered Mail Rates for eCommerce Customers.